“Voters Registration Sunday” was an event conducted last Sunday at EMMANUEL CHRISTIAN CHURCH located in Richmond Hill, where Pastor Daniel Boyd and his lovely wife Elisha Boyd are the leaders. Unity in The Com munity was invited to handle the coordination of this event and help the kick off that will continue this month. This nonpartisan event is a way people of faith can play a unique role in this election cycle by encouraging civil responsibility that will build community and offer a hope-filled vision of the future for all people. Pastor Boyd feels that the “mission of the church is spiritual or religious not political” for reasons that are both theological and legal. The Church’s involvement in public life does not extend to endorsing candidates for election to public office nor calling for their defeat, yet ask people to get involved so they can vote their best interest. 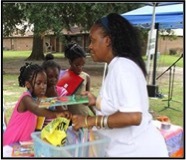 The young people at the Plantation Apartments celebrated going back to school with a Saturday afternoon event. Unity in the Community partnered with the management and residents to make sure the children enjoyed their last weekend before classes began. 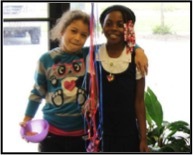 While they played games, enjoyed the bouncy house, food and drinks, they were also able to show off their musical talents in a talent show sponsored by IM Entertainment. Parents were given the opportunity to register to vote. Richmond Hill’s Unity in the Park Festival, coordinated by Unity in the Community, was a success once again. The second annual event took place at J.F. Gregory Park on Saturday, May 31st, and allowed for local business to be showcased to the entire community as well as bring the members together for a fun-filled day. 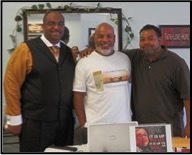 On December 14, 2013, Unity in the Community was a part of the Richmond Hill Chamber 3rd Annual Holiday Market in Richmond Hill, GA at J.F. Gregory Park. In partnership with IM Entertainment, which provided holiday music for the event, Unity in the Community was able to fellowship with many people from Richmond Hill and surrounding areas to spread cheer, good will and connect with those who also believe in embracing diversity. 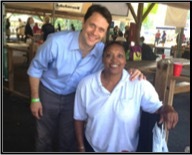 Last weekend, Unity in the Community was invited and come out and visit the Labor Day family picnic at J.F. Gregory Park. This year the picnic was recognizing all of the men and women who work, whether they are teachers, firefighters, police, farmers, and more. Whether its part time or full time, they all are the ones who make America run. On Wednesday, July 16, 2014, Craig and Sharon Butts presented a t-shirt to Renee Deal of Love’s Seafood and Steaks in commemorative with Unity in the Park Festival. Without hesitation, Renee was one of the first businesses to sponsor the 2nd Annual Unity in the Park Festival this year. The organization is very grateful of Love’s support of Unity in the Community and Bryan County. On December 21, 2013, Unity in the Community was a part of the Pooler GA Holiday Market in Pooler, GA. In partnership with IM Entertainment, which provided holiday music for the event, Unity in the Community was able to reach outside the community and communicate with others about the need for unity while spreading cheer, good will and connecting with those who also believe in embracing diversity. On Thursday, September 19th, the Richmond Hill Museum and Historical Society hosted their fourth annual reception and art show “Past and Present…Flora, Fauna, and Faces of Bryan” featuring Arts on the Coast artists creations. On display were photographs, stored in our archives, of diverse people and places whose identity is unknown to us. All members of our community were invited to come by and enjoy the art work and to help in the search to find the story behind each photograph.